Two days to go until this years National Patron saints day in Scotland - St Andrew’s Day. And there’s plenty of activities to be getting on with this weekend - many of them FREE - visit Scotland.org by clicking on the link. But if you are a deerhound you may not want to be doing that - but rather, visiting Rumbling Bridge this Sunday where there will be a St Andrew’s Day coursing meet from 11am. Contact sue@thehoundpad.co.uk for further details. And I hear that there will be a fine pot of Scotch Broth for afternoon warm up. Oh! and the weather forecast couldn’t be more Scotland . . . Misty ! And check out the 18th century painting above rendered in the Scottish School style simply entitled ‘Hero’. This has to be one of my ancestors - I recognize the curl in that tail. Check out the little bookmark featuring intertwined art hounds style of of the kells - interested ? Go here where the company manufacturing it call it a Celtic Dragon . . . hmmm? 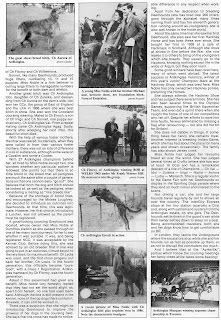 And the book in the pics is also very interesting - a real estate guide for we deerhounds no less, and an enjoyable read to boot. It’s getting close to the season of good cheer and giving (which is how people really should behave all year round). At this time, them human folks go into a desperate frenzy looking for the perfect gift for a loved one or friend. Here’s an idea! 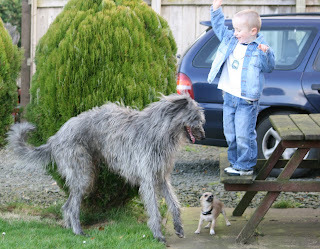 - Howz about an illustration or work of art featuring our blog followers favourites - deerhounds, lurchers or long dogs. 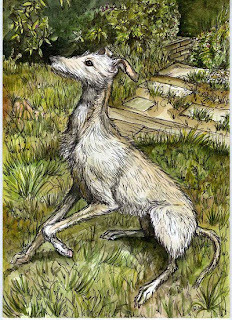 I discovered the artwork of Elle J Wilson whilst on one of my cyber-deerhound walks and had to add her to the blog. Visit her website almost an angel 66 by clicking on her name above and if you do contact her, tell her Rogue sent you. This weekend, we had a visit from a big Mexican death hound named Lemmy and his owner Presley - here we are together, enjoying a spot at the picnic tables. 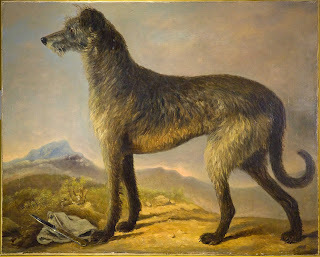 For those in world who did not have the opportunity to enjoy BBC Scotlands ‘A History of Scotland’ episode one, which featured footage of Cusidh Scottish Deerhounds - check out the links and view this fantastic production using BBC iplayer or read the article from the Cusidh website. You can even enjoy several other interactive experiences through the BBC Scotland History website. Why not bookmark it and spend a spot of free time browsing. Oh! and I was just checking to discover whether those bones on ‘Kevs’ bandana were edible or not when someone captured the included photograph. We’ve invested in a wee roll of the ’bonnie plaidie’ for our new background! 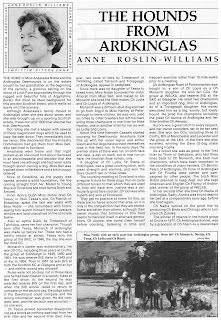 And as a wee ‘bonnie plaidie’ complimentery piece - click here for some rare auld Scots tunes, culled from classic 78 rpm recordings. And remember to tell ’em Rogue reffered you. What it takes to put on the race . . . Nothing beats the beauty and grace of a deerhound in stride, especially today as it courses over Fire Hill near Muckhart. I need say little more than show these images and allow them to do the talking.